Another much-loved shop in Rye is shortly to close. Waterman’s in Lion Street has been a leather goods shop for more than 40 years, according to Jerry Waterman, the proprietor and sole trader who is retiring from active business. The shop has offered its customers almost an old-world welcome, with goods displayed hanging from the ceiling, and overflowing the counters with a seeming generosity that repays browsing and indulging in the gentle art of conversation. 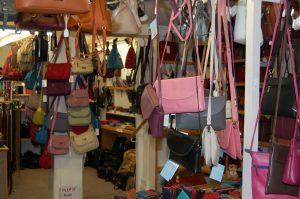 A huge range of handbags, belts, wallets and purses, moccasin slippers and leather/lambswool products have enticed customers to return again and again over the years. Now the premises are up for sale. Not on the open market, apparently, but there are several interested parties, says Jerry and we might expect another antique shop. Jerry has not enjoyed good health these past few years and a recent hospital stay after a fall has made up his mind to retire. Jerry started his career apprenticed to a motor mechanic in Tunbridge Wells before joining Week’s Department Store, looking after their delivery vehicles. “After a while, I got fed up with that and moved with my wife to Cornwall, opening a leather goods shop in Tintagel; but I didn’t like it there so I came back to Lydd and bought this shop in 1974,” he said. He is a private man and has never got involved in local politics, but he has always enjoyed the company of close friends. Two of them were canines, Tiffy a Jack Russell and now Ellie, both of them rescue dogs. His hobbies have been caravanning, driving his Singer Roadster, now sold, and enjoying sharing with friends a 20ft motor cruiser on the River Rother, moored up at Iden Lock. “We never went to sea,” he admitted. Margaret Houselander, who was a long-time assistant in the shop, remembers Jerry for his unfailing good humour and dry wit, but always ready to help people. “He was a delight to work with”, she said. Waterman’s opens now on Saturday mornings only for its closing-down sale. Its impending closure will signify the loss of yet another piece of Rye as many have known it. I am very sad about this. Slippers purses and all sorts have ben purchased from Jerry over the last 18 plus years. He has always been very friendly and extremely helpful. The end of an era. Sorry to hear that Jerry is retiring, but wish him a long, happy and healthy retirement. 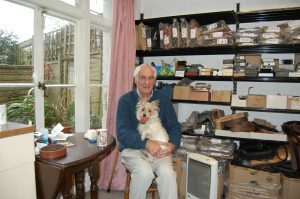 We have bought various items from him over te years and always had a warm welcome in his shop. It will be a loss to the town. He was also always generous to Rye & District Lions Club, with generously every year donating a very good item from his stock for a prize at the Annual Raft Race & Fete. Good luck. Have a well deserved retirement. I only hope we will have a local shop for local people. 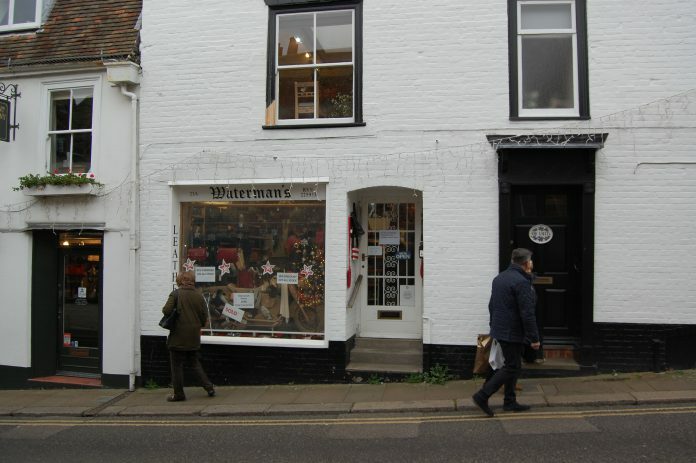 One of the few shops remaining in Rye that actually sell something useful for local residents. A great shame – is there a closure date known yet so that we can pay a last visit?